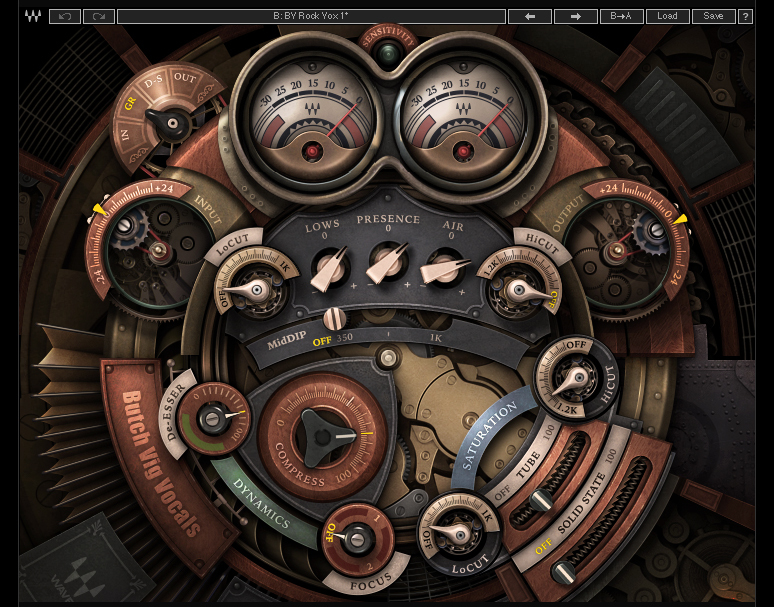 In the tradition of its Jack Joseph Puig, Chris Lord Alge, Eddie Kramer, and Manny Marroquin signature plug-ins, Waves has released Butch Vig Vocals (Mac/PC), a processor plug-in designed to let you easily dial in great Butch-Vig-style vocal sounds. Featuring a very unusual-looking retro/sci-fi GUI, it offers compression, filtering, EQ, de-essing, and two types of saturation. As with any current Waves plug-in, installation is done through either the online or offline version of the Waves installer (Mac or PC), which can install any individual or bundle in the Waves catalog. Authorization comes from the Waves License Center application, which annoyingly installs under the name WLC. Why is that annoying? Because it doesn't have the words "Waves" "License" or "Center" in its name, so when you search your computer for it the next time you need it, it won't show up in your search results. In any case, WLC lets you authorize the plug-in either to your computer or to a USB flash drive or iLok. It’s actually very easy to use. Butch Vig Vocals features the standard Waves toolbar, which, among other things, lets you switch between A and B variations of your settings, which can be quite useful. 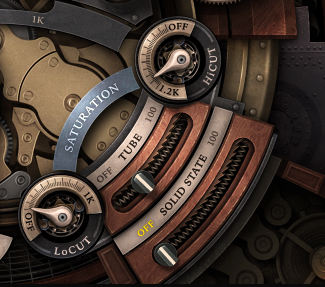 Looking at the interface for Butch Vig Vocals, you wouldn’t be alone if you thought of controls from the submarine in 20,000 Leagues Under the Sea. Although it’s a cool and unusual design, the controls are a bit buried in the graphics. I would have preferred something more straightforward. What’s more, the way some of the knobs turn is not consistent in some cases, which can be counter-intuitive until your familiar with how it works. At the top of the plug-in are level meters. A four-way switch on the upper left-hand side of the meters lets you easily switch between Input, Gain Reduction, DeEsser and Output. On the extreme left and right are the Input and Output controls. The Input knob goes clockwise to increase, while the Output goes counterclockwise to do so, which is one of those inconsistencies I was referring to. A light labeled Sensitivity helps you set the input gain correctly to get the most from the plug-in. According to the manual, when the light is off the level is too low, when it’s green the level is good, when Yellow it's optimal, and when Red, “Very Hot.” I didn’t notice any digital distortion when the input was lighting red, but it certainly intensified the saturation effects (which I’ll describe shortly). Next to the Input and Output controls are the LoCut and HiCut filter knobs. Between them are three preset EQ knobs: Lows, Presence, and Air. The knobs let you boost or cut, depending which way you turn them. In Butch Vig’s very informational intro to the PDF user guide (available right from the plug-in GUI, like on all Waves plug-ins, yay!) he explains that Lows is set at 300 Hz, Presence at 3 kHz and Air at 15 kHz, and that the EQs are based units by Pultec, Neve, Trident A Range, Sontec, Avalon. Near the bottom on the left is the Dynamics section. It features the De-Esser control, which can be set between 0 to 100, and is at a fixed frequency of 6 kHz. The Compressor is a single knob that controls compression amount (based on a fixed threshold). It’s based on the Summit TLA-100 and the 1176. The third component of the Dynamics section is the Focus control, which is a combination EQ and compressor, designed to boost the attack of the vocal note and sustain the rest of it. It offers three possible settings: Off, 1 and 2. Setting 1 is centered at 1 kHz, and Focus 2 at 2 kHz. It’s designed to add clarity to a vocal, so it can cut through without having to be turned up too loud above the instruments. Vig is known for distorted vocals, so it’s not surprising that the plug-in offers a robust Saturation section with both Tube and Solid State options. The Tube distortion is more midrangey and distorts more dramatically, whereas the Solid State gives a more buzzy distortion that’s focused on the upper mids and highs. Lo Cut and Hi Cut filters, placed after the Saturation in the signal chain (and separate from the main LoCut and HiCut filters mentioned earlier) let you EQ the saturation, making it easy to clean up muddiness or buzziness. Both the Tube and Solid State saturation sound very good, can be used separately or together, and are great for adding everything from a little bit of edginess to heavy distortion to a vocal. One thing that Butch Vig Vocals doesn’t have is any ambience processing. This differs from Wave’s Jack Joseph Puig, Chris Lord Alge, and Eddie Kramer signature vocal plug-ins, all of which offer reverb and delay (or a combination in the Puig plug-in) on their vocal plug-ins. So if you’re looking for a complete soup-to-nuts vocal effects chain, you won’t get it with the Vig plug-in. But it will give you everything else you need, and lots of it. 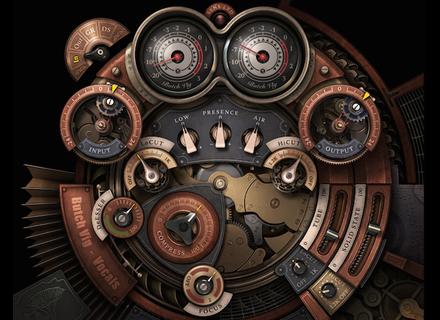 Butch Vig Vocals comes with a wide range of presets, designed by Vig himself offering everything from standard lead vocal settings to settings for Pop and Rock to distorted vocals and special effect vocals. You also get a small bank designed by Chris Lord Alge. Although the compressors, EQ, and filters in Butch Vig Vocals don't offer as many parameters as you'd get with dedicated plug-ins of those types, they’re excellently configured for processing vocals. For example, between the HiCut, LoCut and Mid-Dip filters and the three EQ bands you have a great deal of control over frequency content of the vocal, making it easy to cut out unwanted frequencies, accentuate where you want. Similarly, the compressor has just one knob, but you'd be hard pressed to come up with better vocal settings on a dedicated compressor plug-in. Another strength of this plug-in is for special effects vocals. The telephone, filter and distorted plug-ins let you quickly get some very cool effects that sound, for a lack of a better word, “pro”. The De-Esser worked well on sibilant vocals I tried it on. Since it’s set at a fixed frequency 6 kHz, it’s not going to replace a dedicated de-esser, but it’s helpful to have around. One of the things I like about this plug-in is that even though it’s got a custom control set that combines various processes, the parameters you do get to adjust are, for the most part pretty self explanatory and related directly to real compression and EQ parameters. This stands in contrast to Waves’ Jack Joseph Puig vocal plug-in, which also offers excellent sounds, but has a couple of parameters, “Magic” and “Attitude,” that are not particularly intuitive and which aren’t even described in the manual (the Butch Vig manual offers a lot more information). The only vaguely named parameter in the Vig plug-in, Focus, is clearly described in the manual. Since the plug-in comes with so many presets for other instruments, I figured I try it out as a processor for drums, bass and guitar tracks. From that, I came away with mixed feelings. For some elements, like acoustic guitar, for example, I got some nice results. It also seems good for adding highs or a little bit of distorted edge to instrument tracks. I wouldn’t call it an "all-around instrument processor," however, it’s by far the most effective when you use it for what it was mainly designed for: vocal processing. 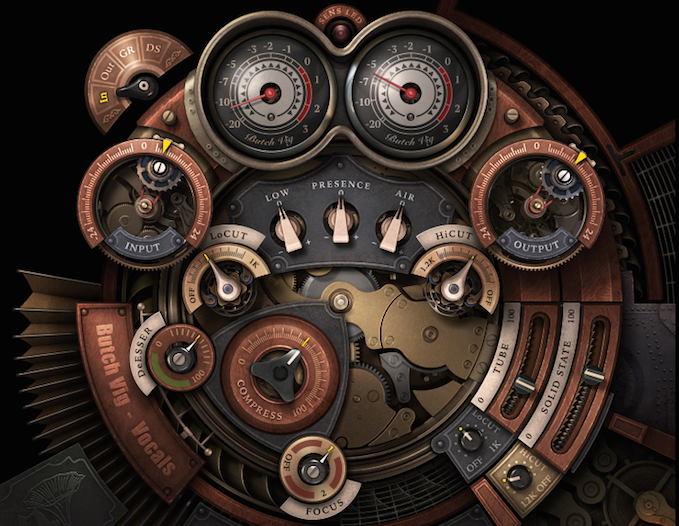 As a whole, I was impressed with Butch Vig Vocals ($99 current sale price/$150 regular price), which let me easily dial up great-sounding vocal processing in a variety of flavors. It’s well priced and, as you’d expect from a product Butch Vig helped create, it’s excels for vocal sounds that are present, “in your face,” distorted or heavily compressed. I really liked the dual saturation section, which is great for a range of distorted vocal sounds (from light to heavy) that you’d otherwise need an EQ, compressor, and a standalone saturation plug-in to approximate. You can get good clean sounds from the plug-in, but it’s definitely aimed more towards the edgy side. As mentioned, I would have preferred a GUI that’s a little more clear and straightforward, and one that has a more consistent scheme for the operation of the knobs and sliders. It would have been nice to also get some ambience options, although that’s not a dealbreaker, by any stretch. Overall, I would recommend this plug-in. It sounds good, offers a ton of presets, is not “dumbed down” like some celebrity plug-ins are, and will give your vocal tracks a distinctive and professional sound.